With a quarter of North Sea rigs set to close in the next decade, a long term lack of supply is the least of the industry's worries. 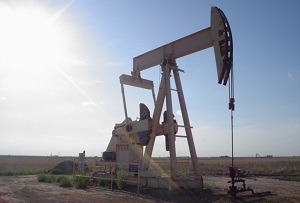 Along with catastrophic climate change, ‘peak oil’ was one of the more realistic doomsday scenarios of the late 20th and early 21st centuries. Global warming still looms large, but few bunker-dwelling End Timers will be wringing their hands about an impending peak (and therefore subsequent decline) in oil production, causing a global economic collapse. If there’s a shortage, even they will tell you, it’s one of demand. In recent years, American frackers and Russian oligarchs boosted production, OPEC sheikhs refused to cut theirs and the world said ‘we’ve got quite enough oil, thanks’. The result – a barrel of Brent crude will now set you back $34 (£23), having fallen from a peak of $115 in mid-2014. Production is poised to fall in the US as investment in new rigs has dried up, and it’s just as bleak in the North Sea. Shell said last year that it will shut the iconic Brent oil field, and a recent report by analysts Douglas Westwood expects a further 146 rigs to close there within the next decade - more than a quarter of the total. With the costs of extraction from North Sea fields among the highest in the world, one nameless executive told the FT it was ‘the beginning of the end’ for the industry there. Someone searching for the bright side might suppose that all this underinvestment will result in the price recovering within the next few years. Indeed a deep commodities cycle does seem the most likely outcome now that OPEC has abandoned its price-setting strategy (in order, somewhat paradoxically, to restore its ability to set the price). But the return of Iranian crude to the market could scupper those hopes. By the time oil’s back to 2011-14 prices again, it could be too late for the North Sea. Long term, though, a return to expensive oil still seems inevitable. Take a look at this chart, showing oil consumption in the developed (North America, Europe and Japan) and developing world. Oil production in the developing world overtook the developed world during the crash. Source EIA; chart: Highcharts. 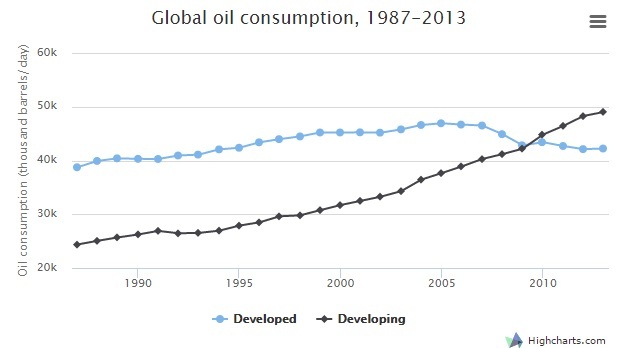 The world consumed 45% more oil in 2013 than it did in 1987. Environment-conscious Europe consumes no more than it did then, while US consumption rose 14% - far less than its population growth. But the developing world remains on a steep upwards curve. China led the pack. Its consumption rose more than 500% and seems very unlikely to slow down (the temporary setback of a hard landing notwithstanding). Xi Jinping has set a national goal of making China a ‘fully developed’ economy by 2049. Let’s say he achieves this goal, and make the cautious assumption that this results in Chinese GDP per capita being roughly the same as America’s is now. With five times as many people, it wouldn’t be a stretch to imagine oil consumption to be five times as high – equal to the whole world’s production today. Rumours of peak oil’s demise have perhaps been exaggerated. There may be trillions of barrels of oil still in the ground and accessible through new technologies, but they will not be reached cheaply. The low hanging fruit has been firmly plucked - long term demand is almost certain to rise faster than supply. Peak oil is perhaps inevitable, but economic catastrophe isn’t. Renewable technology could yet become cheap enough to replace oil, whether that be through electric cars or giant Saudi solar power stations. Given the alternative, we’d better hope it does. Read MT's feature from last year on the impact of the oil price collapse on Aberdeen - it won't have become any easier since.